Is their Nashville-style hot chicken worth the three-hour wait? I don’t do lines. Not for Cronuts, not for a “slutty” egg sandwich, not for a Pink’s chili dog. I avoid lines the way most Angelenos try to dodge traffic, yet here I am in the atrium of Chinatown’s Far East Plaza on a Friday morning, queued up behind 187 other suckers. 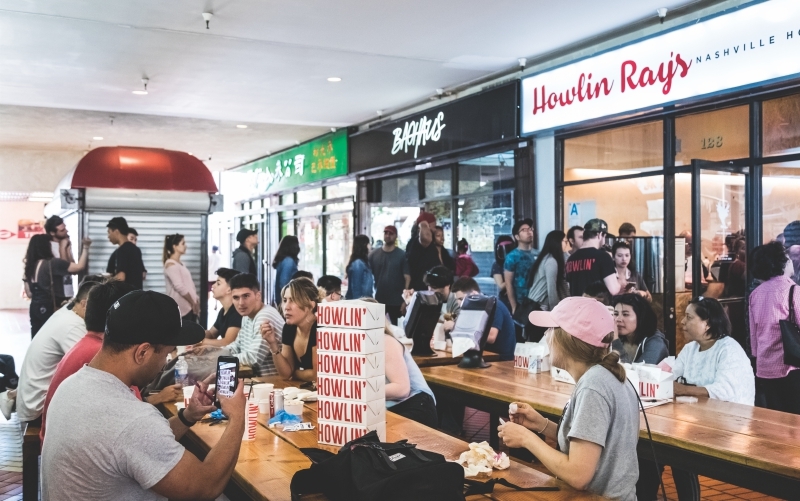 All of us are in pursuit of a universal bliss point: Howlin’ Ray’s Nashville-style hot fried chicken, a dish that regularly commands hours-long waits from the moment the shop opens at 10 a.m. until its 7 p.m. closing time. When Johnny Ray Zone borrowed $80,000 to launch the Howlin’ Ray’s food truck after 12 years grinding on the line for chefs like Gordon Ramsay and Thomas Keller, few people in L.A. knew about Nashville’s signature spice-coated chicken. Despite losing money, he opened his brick-and-mortar in Chinatown in 2016. Back then, Zone had four employees and was lucky to get 150 customers a day. Now he has 23 employees and serves a thousand-plus customers six days a week. That’s at least 600 pounds of chicken per day, each piece potentially seasoned with enough volcanic heat (spice options range from the mild Country to the tongue-singeing Howlin’ ) to ignite your endorphins but enough crunch and flavor to leave you haunted days later. Before all that, though, you have to survive the line. It’s been half an hour, and me and my fellow Angelenos—brown, black, white, newborns, grandparents, weed bros swilling vodka from a water bottle, undergrads studying econ textbooks—have barely moved. Behind me two art kids weigh whether they should try slipping someone at the front of the line a Benjamin. I’m two picnic table lengths from the door. Through the storefront’s glass facade I see a young customer sporting rubber gloves, laughing maniacally as he handles a wing from a box labeled HOWLIN’, which comes with a warning not to touch your face. A glass of milk sits to his right. It’s finally happening. I’m so elated that I forget what I want to order. A worker with an iPad patiently steers me to a fried chicken sandwich and three wings: one Country, one Hot and one Howlin’. “To Live and Die in L.A.” is blasting while I sit at the six-seat counter. Nine cooks stand shoulder to shoulder, breading, frying, dusting, and somehow singing and dancing in unison, chanting, “Yes, chef! ” each time they get their marching orders. Bass vibrates of the walls. Chili powder lingers in the air. A complimentary box of fries appears like a welcome glass of champagne. When my sandwich arrives, steam erupting from the chicken breast, I take a bite, creamy slaw mingling with spicy batter and a cushy bun. Suddenly the line seems like less of a wait and more of a shared experience, a ritualistic prelude to what may be the most deliciously fun meal in the city. The last scribble in my notebook: “I want to come every day and give them all my money.” Maybe I don’t mind lines after all. Next articleWhy Can’t Some Outdoor Cafés in L.A. Serve Wine?